California Advanced Homes Program (CAHP) Builders work with Title 24 consultants to model homes in comparison to the 2016 Title 24, which took effect in January 2017. Title 24 consultants must possess a 2016 California Certified Energy Analyst (CEA) certificate. The program evaluates homes based on a score called the Delta Energy Design Rating (EDR). The entry level is a Delta EDR of 3 – as the score increases, so do the incentives. 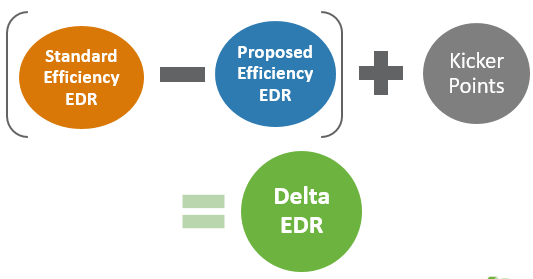 To calculate your project’s Delta EDR, you must subtract the Standard Efficiency EDR (formerly Design) from the Proposed Efficiency EDR (formerly Design), then add any kicker points that apply. The easiest place to grab the information needed to determine your Delta EDR score is on the CF-1R report. Please view our orientation webinar for more information, or contact a TRC representative. Please use the Delta EDR Calculator to estimate the incentive for your home and learn more about incentive kickers. The Program team reviews home plans, model files, and supporting documents to validate each home’s Delta EDR score. Participants may not begin construction until receiving authorization from the Program. Refer to the Program Handbook to see all requirements.